› Electricity production in Iceland is 100% from renewable sources. › Iceland produces more electricity than any other country (per capita). Iceland’s green energy portfolio and the European legal framework offer investors and industries possibilities to gain from some of the strongest drivers and incentives affecting the world’s energy sector. At the turn of the century it looked like the Norwegian petroleum adventure had reached its peak. And that from then on, the petroleum production on the Norwegian continental shelf would only decrease. Oil production on the Norwegian continental shelf did indeed hit a plateau in 2001 and started soon to decline. However with new major discoveries of additional petroleum resources, including both oil and gas, this amazing period of the Norwegian petroleum-age has been extended further into the 21st century. Now it is expected that petroleum production (combined production of oil and natural gas) on the Norwegian shelf will grow somewhat in the coming years (at least until 2023). Then the production will reach the final plateau and start a real and steady decline. And the slope of the decline may become quite steep. Norway’s population is only close to five million. Yet, Norway is the world’s third largest exporter of oil and gas (after Saudi Arabia and Russia). And there is only one country that produces more petroleum from the continental shelf than Norway, which is Saudi Arabia. Although Norway describes itself as “a small player in the global crude market”, with its oil production covering about 2% of the current global demand, Norway is the third largest exporter of natural gas in the world. And Norway supplies about ¼ of the EU gas demand. When having in mind the population of countries, Norway is the second largest petroleum producer (per capita). Only Qatar produces more oil and gas per capita. Other major petroleum producers per capita, are mostly other states at the Persian Gulf, like Kuwait and UAE. Another interesting fact regarding Norway’s massive petroleum production, is the enormous size of the Norwegian Oil Fund (the Government Pension Fund Global). Last year (2017) the value of the fund reached over 1,000 billion USD. 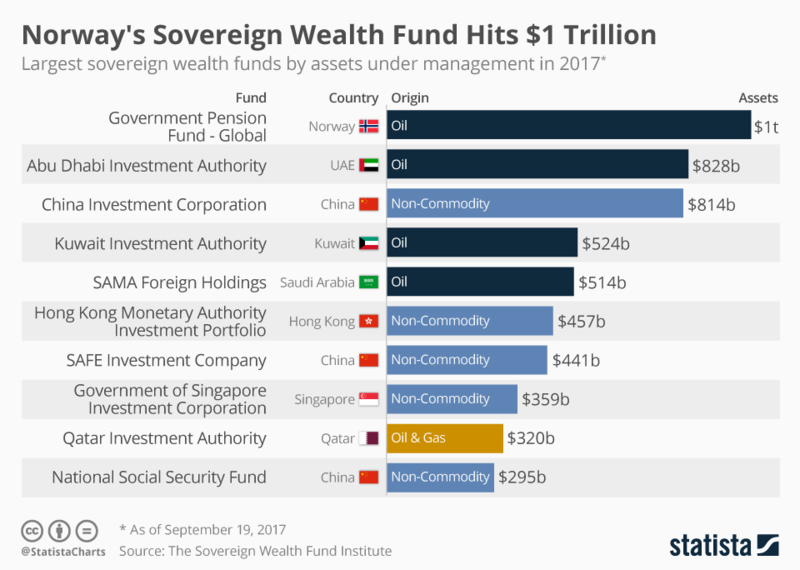 The Oil Fund of Norway is the world’s largest sovereign wealth fund. With recent decline in share prices, right now the value of the fund may be somewhat lower than 1,000 billion USD. However, most countries and governments accept that Norwegians have done very well with their petroleum wealth. And although Norway may be reaching its peak in petroleum production, the peak of the Oil Fund is probably much farther in the future. The proposed HVDC power interconnector between UK and Iceland, sometimes referred to as IceLink, seems to be moving along. This is happening despite the imminent Brexit and the uncertainty that the Brexit creates regarding Britain’s future energy policy. 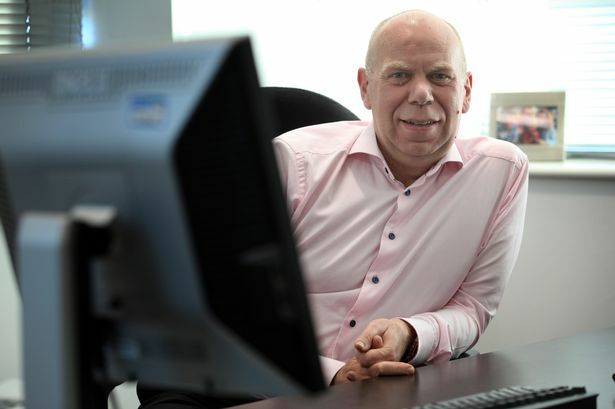 The British company Atlantic SuperConnection, which seems to be a subsidiary of Disruptive Capital Finance, has for years been introducing plans for a 1,200 MW subsea power cable between Britain and Iceland. About a year ago, Atlantic SuperConnection claimed the cable might be in operation already by 2023. Now the company says that the plan is to have the cable ready and operating in 2025. It is also interesting that Atlantic SuperConnection recently announced plans for constructing a factory in Northeastern England where the cable will be made. This new highly special cable-factory is supposed to be ready within a few years from now. 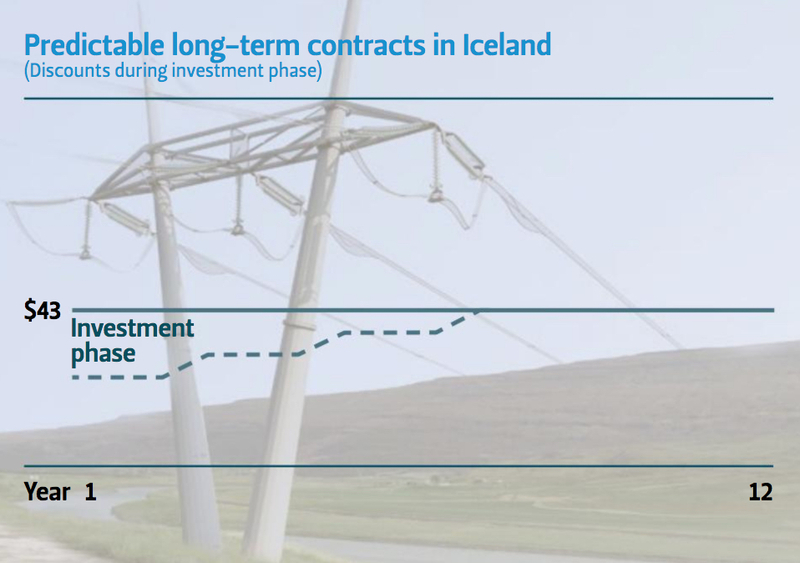 If these plans of Atlantic SuperConnection will be realised, the demand for Icelandic electricity will probably increase by many thousands of GWh annually, even as soon as in 2025. In this article we discuss these very ambitious (and somewhat unrealistic) plans of Atlantic SuperConnection. No new power plant required? As described later in the article, the required annual generation for the IceLink cable is estimated to be approximately 5,000-6,000 GWh. Current total electricity production and consumption in Iceland is about 19,000 GWh per year. It is interesting to examine how it will be possible to provide all the electricity needed for the IceLink cable. Having regard to the current electricity production and consumption in Iceland at 19,000 GWh, it is interesting that on its website Atlantic SuperConnection says that it will be possible to have the IceLink operating even with “few or no new power plants” in Iceland. This statements by Atlantic SuperConnection is somewhat misleading, as it is obvious the IceLink will call for major construction of new (and upgraded) power plants in Iceland. The view of Atlantic SuperConnection, introducing that there may be no need for any new power plant in Iceland, is in contrast to the vision that the Icelandic national power company Landsvirkjun has introduced regarding the cable. In a series of presentations and interviews Landsvirkjun’s management has said that the IceLink cable would need a supply of between 5,000-6,000 GWh. Landsvirkjun has also introduced that most of this electricity needs to come from new power plants. According to current information on the website of Landsvirkjun, the cable would export about 5,700 GWh and due to transmission losses in Iceland the cable will need a generation of close to 5,800 GWh. 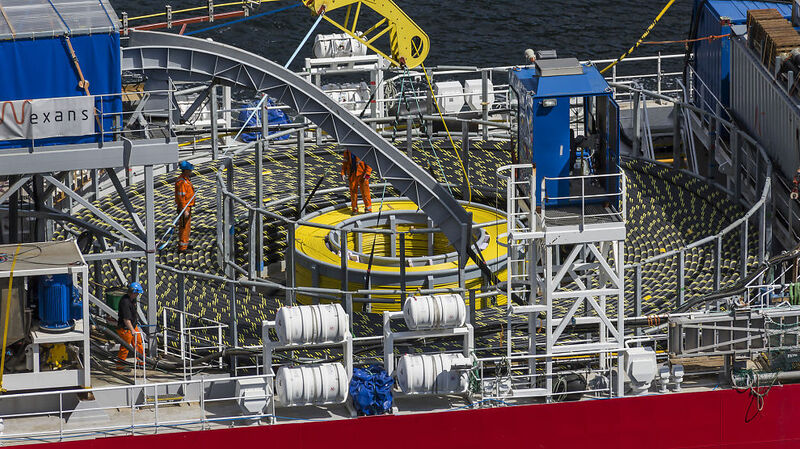 Here we should also have in mind that, according to estimates by Atlantic SuperConnection, the transmission losses in the subsea cable are expected to be close to 5%. Total additional generation in Iceland for the cable was expected to be 5,000 GWh annually. 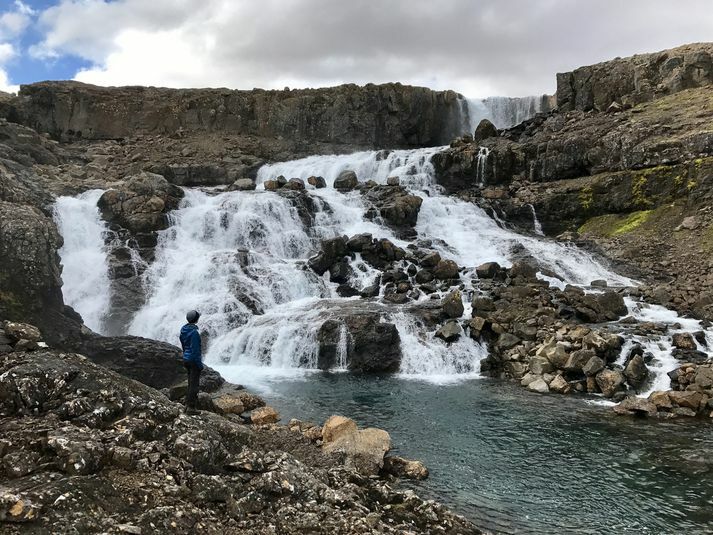 2,000 GWh would be achieved by better utilization of the existing power system in Iceland, including utilisation of current over-flow in the hydropower plants, and by putting up new turbines in existing hydroelectric power plants (including 150 MW in the Kárahnjúkar power station). 3,000 GWh would be achieved by constructing new power plants in Iceland, including both geothermal, hydro and wind power. Total generation in Iceland for the IceLink cable is now expected to be 5,800 GWh annually. 1,900 GWh would be achieved by better utilization of existing power system in Iceland, including new turbines in existing hydroelectric power plants and utilisation of hydro over-flow. 3,900 GWh would be achieved by constructing new power plants in Iceland, including both geothermal, hydro and wind power. This means that just to fulfill the power demand of the IceLink cable, it would be necessary to increase electricity production in Iceland from the current 19,000 GWh to approximately 24,800 GWh. Which is approximately 30% increase. 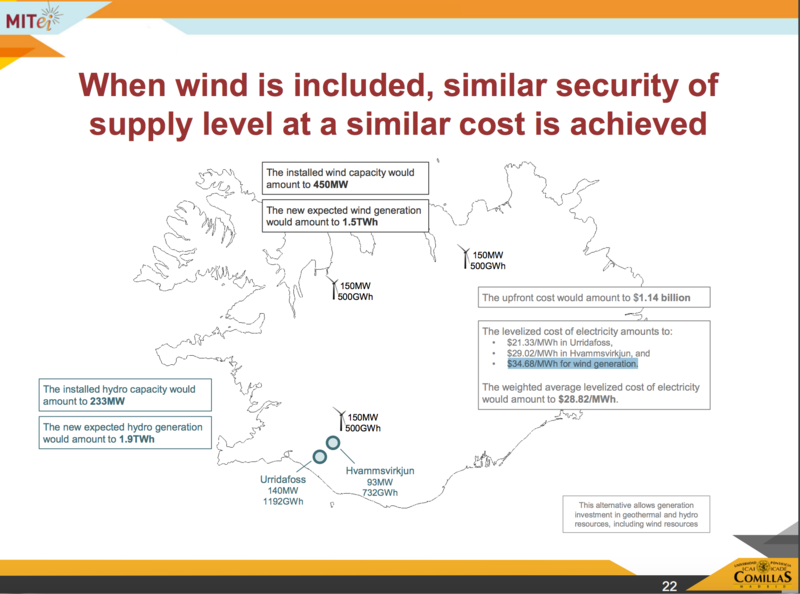 So the national power company of Iceland introduces that to have enough power available for IceLink, Iceland needs to increase its electricity generation by 30% and approximately 3,900 GWh of this will need to come from new power plants. At the same time, Atlantic SuperConnection says that “ideally” the IceLink will call for none or at et last few new power plants in Iceland. This statement by Atlantic SuperConnection is not realistic, and becomes even more puzzling when having regard to the fact that the figures from Landsvirkjun are based on the prerequisite that the IceLink will have a capacity of 1,000 MW. While Atlantic SuperConnection says the cable will be 1,200 MW. In fact several important aspects in the presentation of IceLink by Atlantic SuperConnection are at odds with facts and reality. 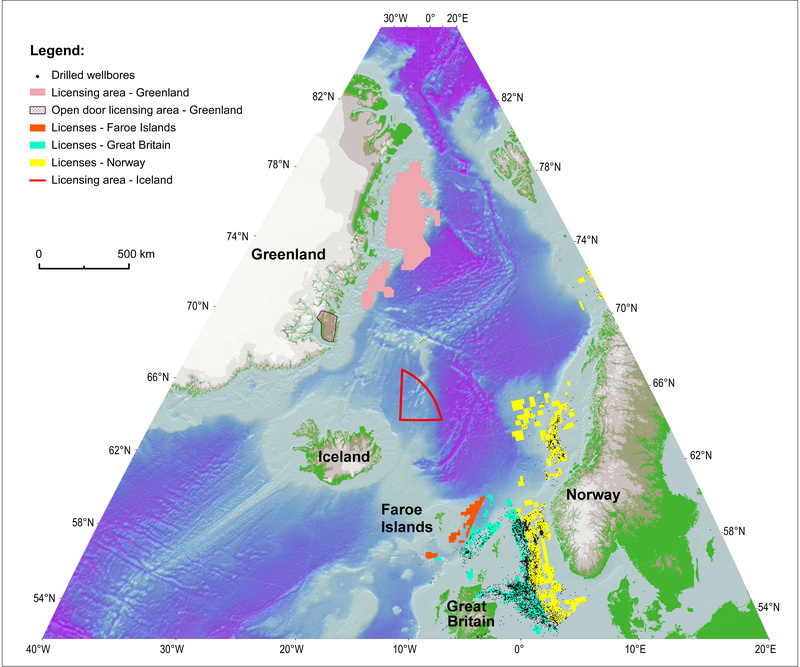 And the difference between Landsvirkjun’s scenario and the claims made by Atlantic SuperConnection may even weaken the credibility of the IceLink project. Probably it would be advisable for Atlantic SuperConnection and Disruptive Capital to clarify or explain the inconsistency. In addition, Atlantic SuperConnection seems to misunderstand the energy situation in Iceland. On its website the company states that it can approach and ”bring a near-limitless source of clean hydroelectric and geothermal power to the UK”. This is far from the reality. By major construction of new geothermal-, hydro-, and wind power plants, in addition to major upgrading in current hydropower plants and utilisation of over-flow from current hydro reservoirs. This is the scenario which has been introduced by Landsvirkjun and is the most realistic way to develop the project. By utilizing the power that currently is consumed by the aluminum smelter of Norðurál (Century Aluminum). Most of the power contracts with the Norðurál smelter will run out in the period 2023-2026, which may fit the timeline for IceLink. However, this scenario would probably be met with heavy resistance from the communities close to the smelter, and is hardly a realistic option. By scaling the cable down to a maximum size of approximately 600-700 MW. Then the generation-need for the cable would probably be around 3,000-4,000 GWh. Although this size of cable would also call for substantial increase of power generation and construction of some new power stations in Iceland, it would make the project more manageable. The question remains if a cable of such a limited size would ever become economical. If Atlantic SuperConnection really wants to see a power cable between Iceland and UK become a reality, the company should probably emphasise scenario no. 1 above (although scenario no. 3 may also be considered). This kind of project is indeed an interesting option for both countries; Iceland and Britain. Yet, it will never be realised unless it will be based on facts and the will and support of the Icelandic government. Five years ago, when the Icelandic National Energy Agency (NEA) granted two licences for oil exploration to Faroe Petroleum and Valiant Petroleum (now part of Canadian Ithaca Energy), there were high hopes this would be the start of an Icelandic oil adventure. The optimism even increased a year later, when the Chinese giant CNOOC became operator in a third license. At this stage it is unclear what steps the Icelandic NEA will take regarding the oil exploration, such as if the agency will start a new licensing round. It should be noted that one of the partners in the license hold by CNOOC as operator, is still holding on the license, trying to find new qualified partner(s). Those who may be interested in stepping into the license, should contact Eykon Energy. Those who seek, find – perhaps! 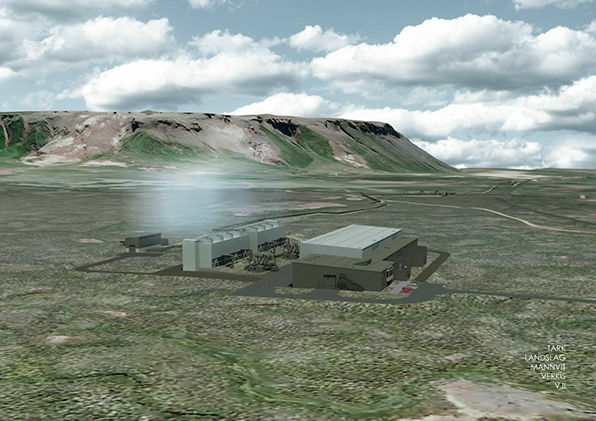 The Icelandic national power company Landsvirkjun supplies three aluminum smelters with power. The graph below shows how the electricity tariffs in this business have developed in the past ten years. As clearly can be seen on the graph, the electricity tariffs paid by the three smelters were somewhat higher in 2017 than the year before. The main explanation for the higher tariffs in 2017 is the rising price of aluminum. Two of the three smelters buying electricity from Landsvirkjun have their power tariff linked to the price of aluminum at the London Metal Exchange (LME), while the tariff to the third smelter (Rio Tinto / ÍSAL) is linked to US consumer price index (CPI). In 2017, as ever since the re-negotiation of 2010, the aluminum plant of Rio Tinto (ÍSAL) in Straumsvík paid the highest power tariff. The lowest price was paid by the smelter of Century Aluminum (Norðurál), while the smelter of Alcoa (Fjarðaál) paid slightly higher tariff than Century. This article focuses on the pricing policy of the Icelandic national power company Landsvirkjun. Although starting price in recent new contracts seems to have been between 25-35 USD/MWh, we may expect higher tariffs in the future. Due to rising cost of new power plants in Iceland, it seems likely that from now the normal starting price in new electricity contracts will be close to 35 USD/MWh, rising towards 40 USD/MWh. 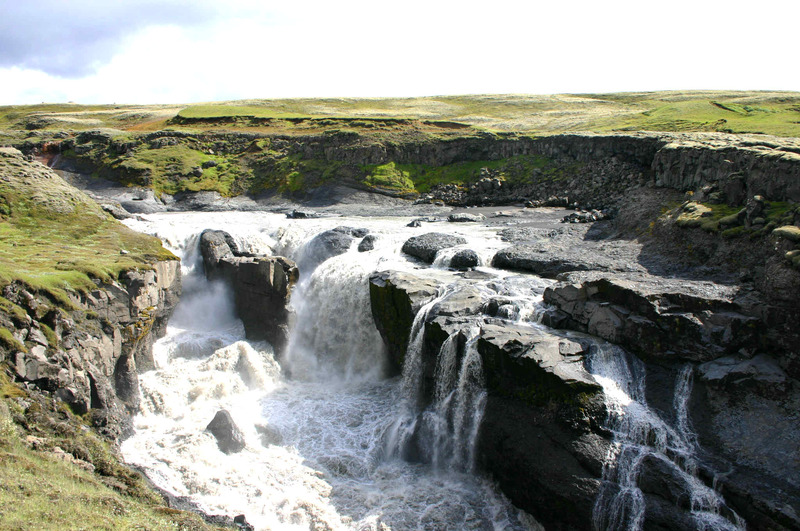 Landsvirkjun produces close to 75% of all electricity generated in Iceland. The company sells most of this electricity directly to four large consumers; three aluminum smelters and one ferro-silicon plant. Landsvirkjun also has contracts with smaller consumers, such as other types of industrial plants and data centers. Finally, substantial part of the generation is sold in wholesale-contracts to other power companies, for resale on the general power market. According to Landsvirkjun’s website the company is “committed to offering competitive electricity contracts, based on the European electricity market, by offer­ing long-term agree­ments, favour­able prices and an unparalleled security of supply.” Lands­virkj­un has since 2011 offer­ed 12 year power con­tracts with a head­line rate of 43 USD/MWh. Landsvirkjun has also expressed that the company offers electricity-contracts at a fixed real price of 43 USD/MWh, with discounts for selected greenfield projects. These general statements by Landsvirkjun do not make it very clear what tariffs Landsvirkjun offers. We can assume though, that Landsvirkjun aims at a price close to 43 USD/MWh, arguably indexed to inflation within European Union (and/or within United States / Canada, as Landsvirkjun sometimes refers to these countries as their competitive markets). Still, it is somewhat unclear what tariffs new customers may expect from Landsvirkjun. What we do know, is that new customers of Landsvirkjun are offered power tariffs starting well below the said 43 USD/MWh. We also know that this lower tariff may extend for a period of at least five to seven years, as described in a presentation in 2012 by the current CEO of Landsvirkjun. So what are the tariffs offered to new customers for the first five to seven years? According to information we have from the data centre services in Iceland, starting price in such contracts seem to be close to or somewhat below 35 USD/MWh. 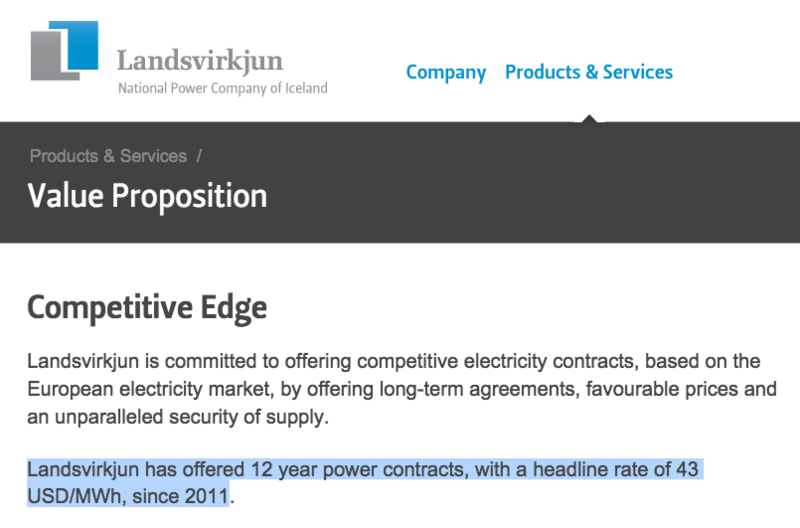 In larger contracts, such as with the new silicon industry in Iceland, Landsvirkjun seems to have been offering a starting tariff below 30 USD/MWh. In general we can assume that recent starting tariff to Landsvirkjun’s new customers has in general been somewhere between 25-35 USD/MWh (the transmission cost is not included). During the last few years Landsvirkjun has renegotiated with two of the aluminum smelters located in Iceland. According to analysis by Askja Energy Partners, the power tariff to the Straumsvík smelter is approaching 35 USD/MWh. Note that the transmission cost is included in this price, which means that the smelter in Straumsvík (Rio Tinto Alcan / ÍSAL) is currently paying Landsvirkjun close to or slightly below 30 USD/MWh (without the transmission cost). This tariff is linked to the US consumer price index (CPI). 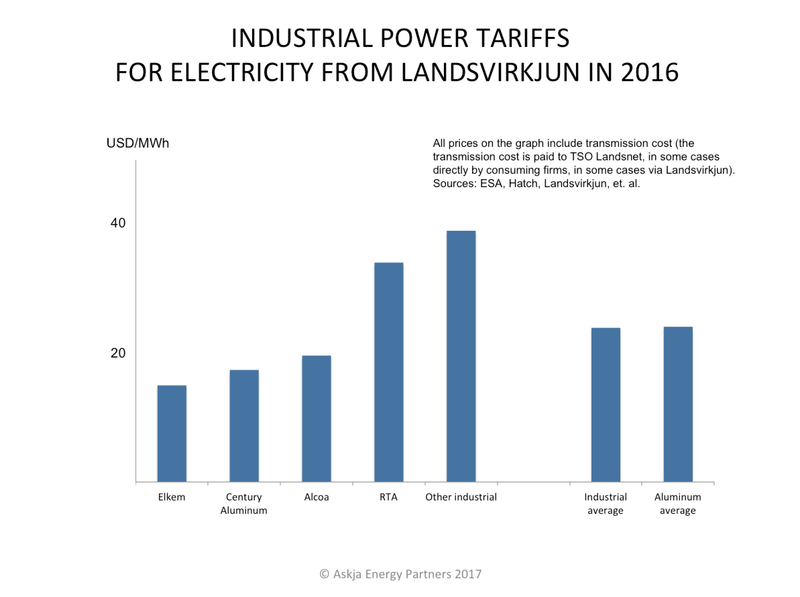 Landsvirkjun’s new tariff negotiated with the aluminum smelter of Norðurál at Grundartangi is set up by a very different method, as it is aligned to market price of electricity on the Nordic power market. The new tariff for Norðurál (Century Aluminum) goes into effect in 2019. When looking at the current monthly market price at the Nord Pool Spot we can assume that from 2019 Norðurál will be paying Landsvirkjun close to 30 USD/MWh when the transmission cost is not taken inro account. Thus it may be fair to say, that Landsvirkjun’s wholesale tariff in renegotiated large contracts is close to 30 USD/MWh. Tariffs in new power contracts by Landsvirkjun are probably in general indexed to price inflation (such as in USA or EU). Also it is likely that the contracts include fixed price increase after five to seven years, resulting in tariffs heading towards 40 USD/MWh (and possibly towards the advertised 43 USD/MWh). This, however, does not apply to renegotiated contracts with heavy industries such as aluminum smelters, where the tariffs are either aligned with the power price on the Nordic market or consumer price index in the USA. In recent years, the management of Landsvirkjun has repeatedly expressed that the company wants to move away from power contracts having tariff linked to the price of aluminum (or other relevant products such as ferrosilicon). However, it seems clear that Landsvirkjun is sometimes still open to such product-pricing methods. According to information from the EFTA Surveillance Authority (ESA), the new silicon plant of PCC in Iceland seems to have its power price linked to the price of silicon metal. Due to strong demand for electricity, the Icelandic power market is currently a sellers-market. Furthermore, it is hardly possible to construct a new power plant in Iceland unless the electricity can be sold at an average price close to at least 35 USD/MWh. 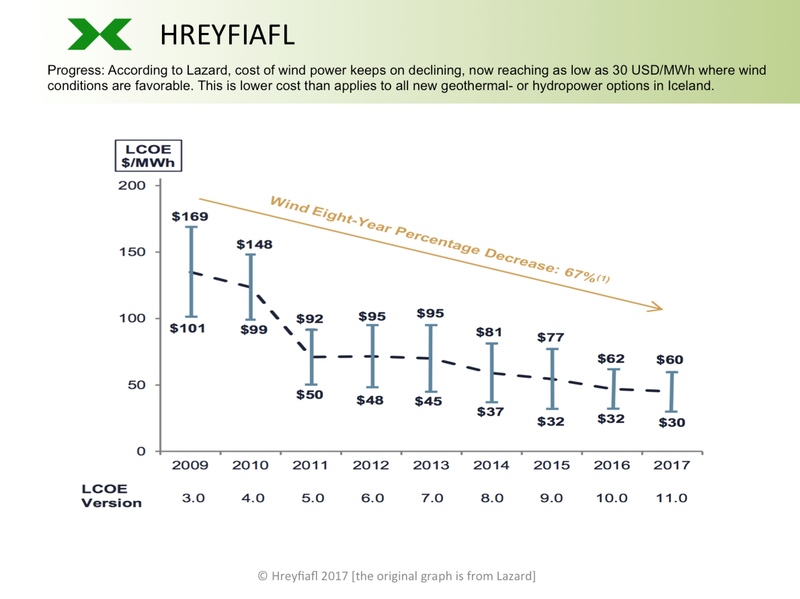 Of course this means that when offering a 12 year contracts, Landsvirkjun may be able to offer lower starting price if the tariff will rise towards 40 USD/MWh after approximately five years or so. But in general we can expect that due to the strong demand for electricity in Iceland and rising cost of new power plants in the country, the general wholesale power prices will in general not be lower than 35 USD/MWh and even soon be heading towards 40 USD/MWh. In fact the general wholesale price for electricity in Iceland in 2016 was close to 38 USD/MWh. With close to 1,100 GWh annually, the ferro-silicon plant of Elkem in Iceland is the 4th largest power consumer in the country. The power is supplied by the state-owned power firm Landsvirkjun. Elkem is a Norwegian firm, owned by China National Bluestar Group. 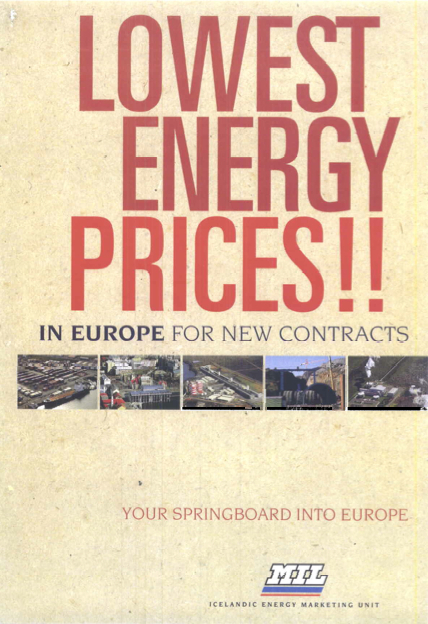 Current power contract of Landsvirkjun and Elkem was agreed two decades ago, at times when heavy industries were offered very low tariffs when locating in Iceland (as for example advertised in a brochure from the Icelandic government in 1995; note cover at left). The power contract is valid until 2019. Elkem and Landsvirkjun have still been unable to reach a new agreement, so it is not certain if Elkem will continue its Icelandic operations after 2019. The most likely scenario seems to be a new contract where the power price will align with the market price on the Nordic electricity market (Elspot on NordPool Spot), as was the result in recent negotiations regarding the Norðurál aluminum smelter owned by Century Aluminum. According to current prices, this would result in approximately doubling of the electricity tariff paid by Elkem in Iceland. Most of the revenues from the electricity sales of Landsvirkjun are derived from the aluminum smelter of Rio Tinto (ÍSAL) in Straumsvík, which supplies Landsvirkjun with close to 1/3rd of it revenues although the smelter purchases only 1/4th of Landsvirkjun’s production. The second most important customer of Landsvirkjun is the aluminum smelter of Alcoa, as can be seen on the table at left. When taken together, the other power firms in Iceland and the TSO Landsnet are Landsvirkjun’s third most important customer. The sales to Elkem alone amount to about 8% of Landsvirkjun’s electricity sales, ie. when based on the amount of electricity. Although this is not a very high percentage of the total electricity generated by Landsvirkjun, it is of course important for the power firm to obtain increased revenues from Elkem, as Elkem now only returns about 5% of the income of the company. Actually the percentage for the net-income is even lower, as the power tariffs to heavy industries include the transmission cost (this part of Landsvirkjun’s revenues is forwarded to the TSO). Elkem has been paying the lowest electricity price of all the industrial companies in Iceland. The CEO of Landsvirkjun has previously said that the current tariff Elkem pays reflects very different economic environment from now, indicating that a sharp increase in the power price would be absolutely normal. Earlier this month (November 2017), the CEO also pointed out that now “there is no reason why the price of electricity should be lower in Iceland than in the markets of [Canada and Norway].” This is a very clear statement, expressing that Elkem may be able to get a new contract where the power price will be aligned to the market price in Norway or Canada, but not lower tariff than that. 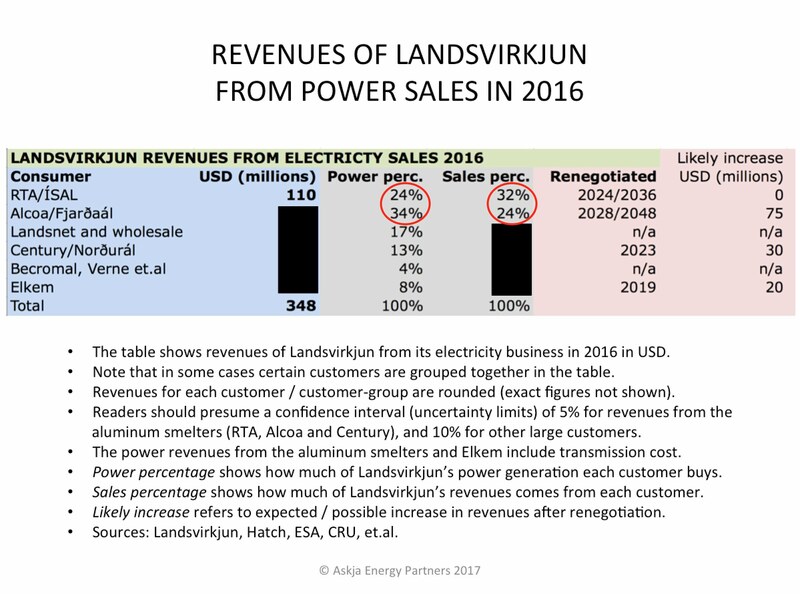 In 2016, Elkem paid Landsvirkjun close to USD 18 million for the electricity (estimates by Askja Energy Partners). In a new contract that would come into effect in 2019, Landsvirkjun is probably aiming for a tariff that would mean extra USD 20 millions added to Elkem’s power bill. The total annual power cost of Elkem would then rise to approximately USD 38 millions (those figures include the transmission cost). As it is possible and even likely that Elkem’s new tariff will be linked or aligned to the Elspot price on the Nordic power market, the power price would of course fluctuate. The given figure of USD 38 millions assumes that the Elspot price will be close to 30 EUR/MWh. If/when the price will become higher, the tariff of Elkem would rise. Probably the only option for Elkem to receive a more positive tariff for the company in Iceland after 2019, is to expand its operations in the country. For example it will be interesting to see if Elkem offers Landsvirkjun and the Icelandic government to move some of its solar-silicon production from Norway to Iceland. NB: All figures on revenues in the table above are approximate / rounded. More precise figures are available only to customers of Askja Energy Partners. NB: 2016 is the fourth year the NEA publishes data for generated wind power in Iceland. Electricity generated by wind power (9 GWh) and fossil fuels (3 GWh) was to small amount to be measured as a percentage on the scale of the table above. The combined wind- and fossil fuels generation amounted to 12 GWh, which was less than 0.001% of all electricity generated in Iceland in 2016. You will find more Icelandic energy data in our special data-section. Iceland’s newest power plant is the 45 MW Þeistareykjavirkjun in Northeast Iceland. The owner and operator of the plant is the Icelandic national power company Landsvirkjun. The silicon-metal plant of PCC. The construction of this first phase of the power plant started in the spring of 2015. Most of the generation will be transmitted to a silicon metal plant of PCC. The PCC silicon plant will utilize a total of 52 MW in the start. According to the power contract with Landsvirkjun, PCC will gradually increase its power demand up to 58 MW. Annual energy delivery is expected to start at 456 GWh and then gradually increase to 508 GWh per annum within the next 4 years (article 3 of the power contract). As the 45 MW phase of the Þeistareykir plant will only generate 360-370 GWh annually, Landsvirkjun must also deliver power from other power plants to PCC. However, Landsvirkjun is already constructing next phase of Þeistareykir, adding another 45 MW. This second phase of the geothermal plant is scheduled to become operational in next April (2018), making the total capacity 90 MW. At this stage, the additional capacity can only be utilised by power consumers in the Northeastern part of Iceland, as the national transmission grid has several bottlenecks. This most recent geothermal project is believed to be the most economical of all the upcoming geothermal power projects in Iceland. According to information from Landsvirkjun, the cost of this first 45 MW phase is close to USD 200 millions, which accounts for approximately USD 4.5 millions pr. MW. With a second phase, the total cost for the 90 MW plant is expected to be close to USD 330 millions. Then the cost of each MW will be close to USD 3.7 millions. In 2010 the power contract of Rio Tinto Alcan and the Icelandic national power company Landsvirkjun, regarding the Straumsvík aluminum smelter, was negotiated. This new contract turned out to be a major step towards increasing profitability in the Icelandic electricity sector. In this article we discuss the importance of the contract from 2010. By 2010 there already were three large aluminum smelters in Iceland. The oldest of the three was a plant at Straumsvík in Soutwest Iceland, owned by RTA/ÍSAL. This smelter was originally constructed in the late 1960’s. and until 2010 it had been paying the lowest power tariffs in Iceland. In preparing for the negotiations for a new power contract, Landsvirkjun commissioned the consultancy company CRU Group to review and assess the existing preliminary agreement with RTA (which had been reached shortly before Iceland’s banking crash in 2008). According to the information provided, CRU established that out of 184 aluminium smelters worldwide, Iceland provided the 14th lowest price and 3rd lowest out of 32 smelters in Europe (as explained in a report by EFTA Surveillance Authority, published in 2011). This meant that of the 184 aluminum plants worldwide, about 170 plants were paying higher power tariffs than the smelters in Iceland! With regard to this information, the management of Landsvirkjun claimed that the power tariff in a new contract would need to change substantially from the then very low present tariff. This claim was a.o. based on less favourable credit rating of Landsvirkjun (following Iceland’s banking crash in 2008), high cost of capital, limited access to credit, and the considerable increased power price in the US and in Europe in the past years. Furthermore, the management of Landsvirkjun expressed it would be unacceptable risk for the power company to continue having the power price linked to aluminium prices. The new power contract, which was ready in 2010, introduced a very different criteria for the price of the electricity. According to the old contract the base tariff was extremely low, compared to other similar contracts, and this old tariff was linked to the price of aluminum on the London Metal Exchange (LME). The new contract signed in 2010 had a starting price close to 30 USD/MWh and the tariff changes according to the US Consumer Price Index (CPI). Currently, the tariff to the Straumsvík smelter is now most likely approaching 35 USD/MWh, which is approximately double the tariff according to the old contract. Included in the power price is transmission cost (in Iceland average transmission cost to heavy industries is normally close to 6 USD/MWh). The new power contract with RTA/ÍSAL will expiry in 2036. According to a special price equilibrium mechanism prescribed in the contract, the power tariff shall be revised once during the contract period (in 2024). This mechanism’s objective shall be “to keep a similar competitive position of the Straumsvík smelter as it was at the time of signing the new power contract” in June 2010. Also, Landsvirkjun is given the opportunity “to ensure that its power remains competitive in line with other energy producers” supplying power to the aluminium industry. This new contract between Landsvirkjun and RTA/ÍSAL is the main prerequisite for Landsvirkjun’s positive operating profit in recent years. Now close to 1/3rd of Landsvirkjun’s revenues from electricity sales comes from the RTA/ÍSAL smelter in Straumsvík, while the smelter accounts for only 1/4th of Landsvirkjun’s electricity generation. 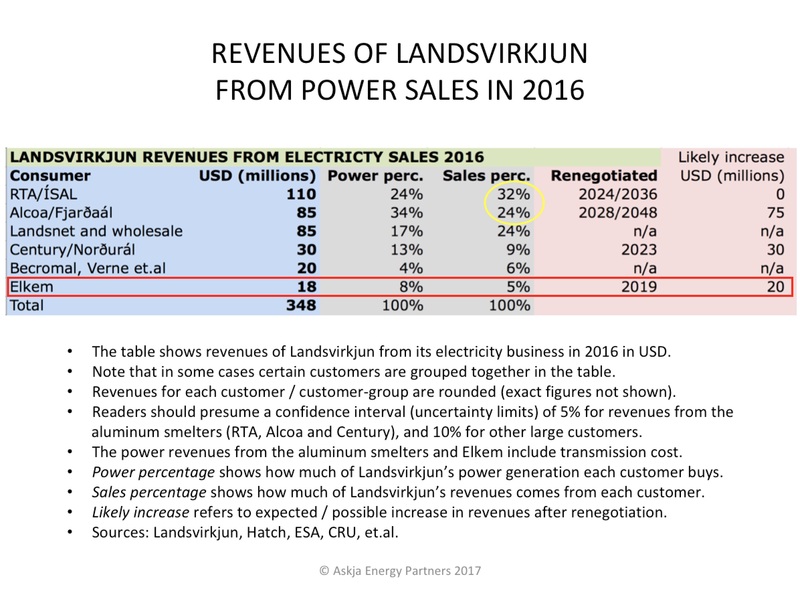 These figures say a lot about the importance of the contract for Landsvirkjun; note the table below (and also note the graph above showing power tariffs of Landsvirkjun to aluminum smelters 2007-2016). This proportion (1/3rd of revenues for 1/4th of power) is almost exactly the opposite of what applies to Landsvirkjun’s contract with the aluminum smelter of Alcoa/Fjarðaál in Eastern Iceland. That deal, which is from 2003, returns just 1/4th of Landsvirkjun’s electricity revenues although it accounts for about 1/3rd of all the energy sold by the company. This ratio explains clearly how much higher power tariff is paid by the RTA/ÍSAL smelter than the Alcoa/ Fjarðaál smelter. 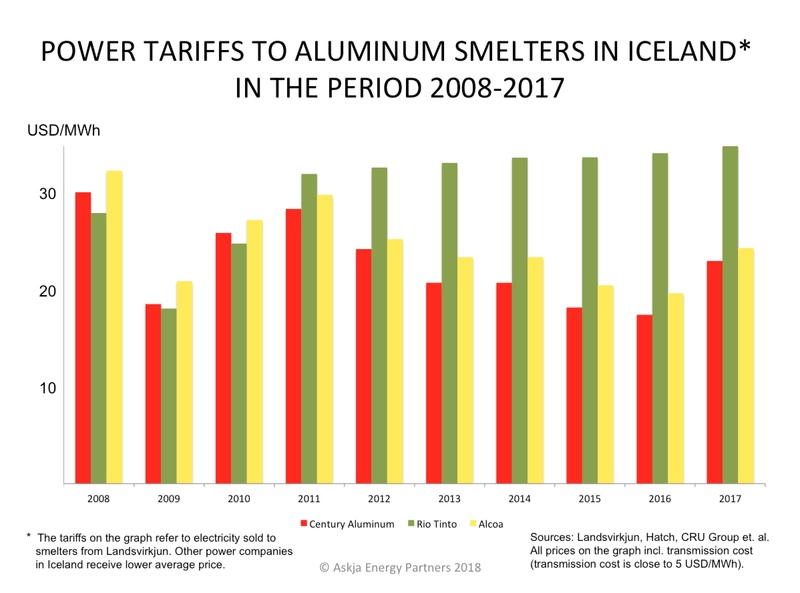 The power tariff to the Alcoa/Fjarðaál smelter is linked to price of aluminum. To reach the current power price of the Straumsvík smelter of RTA/ÍSAL, aluminum prices would need to increase to about 2,800 USD/ton. Which is very far from the current price for aluminum, now close to 1,950 USD/ton (while the average price in 2016 was close to 1,600 USD/ton). It is impossible to say if price of aluminum will ever reach 2,800 USD/ton in the near future. What is clear though, is that Landsvirkjun’s recent contract with RTA/ÍSAL has substantially decreased the risk for the power company and hugely increased its revenues and strengthen its profits and its financial situation. Thus it is no surprise that the contract has been referred to as “a miracle” for Landsvirkjun. 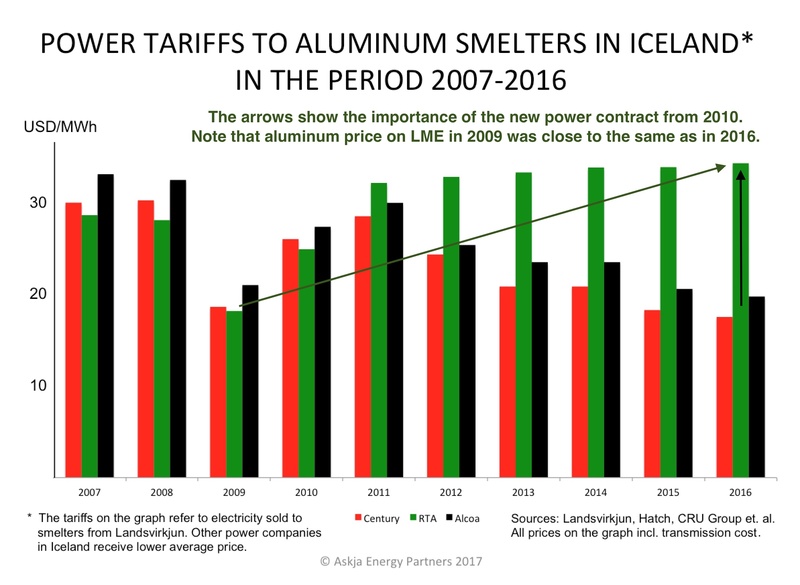 For recent information in the media on power tariffs to smelters in Iceland, note this article by Aluminium Insider (“Is Winter Coming for Iceland’s Aluminium Smelters?”) and this brand new article in the New York Times about electricity cost for smelters in Iceland. More detailed information about electricity prices according to Landsvirkjun’s power contracts, can be obtained from our consultancy services.